If you have a few days available, and you are thirsty for adventure, why not consider one of our 3-day sea-kayaking expeditions. This is a rare chance to explore some of the remoter areas of Turkey that few visitors ever see, and to experience its historical and natural heritage from a very different perspective. These are true expeditions � we carry all our gear and food in the kayaks, and camp in a different place every night. We provide all meals, mostly cooked in camp (these are often one of the highlights of the trip). 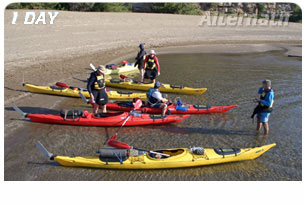 We offer a variety of trips, listed below, suitable for beginners and people with previous paddling experience. Most of our guided trips are camping-based; on some routes, for private groups we also offer the option of accommodation in small pensions for part or all of the trip. Any of them can modified if required and incorporated into a customised itinerary. Lake, channel and sea. Hot springs and mud bathsCaunos ruins and rock tombs.K�ycegiz Lake-wildlife haven. 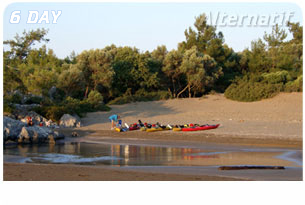 Cleopatra�s Island/ancient Cedrae.Akyaka delta � wildlife haven. "I just wanted to thank Alternatif Outdoor for such a great holiday. The equipment was excellent, the route worked really well and looked well researched. The level of activity was just right: challenging, but with some relaxed afternoons on the beach. We�ve had a great time, I�d recommend you to anyone." "Really enjoyed all aspects of this holiday � great fun from start to finish. Felt very comfortable and relaxed with the excellent competence of the leaders. I was extremely impressed with the planning and running of the trip, and the culinary skills were brilliant! Thanks a million." �"It is a pleasure for me to forward a troughout positive feedback to our tour performed last week. There is nearly nothing to improve. As well thanks to you for unbureaucratic and reliable administration and the really nice accomodations provided at the beginning in Koycegiz and at the end in Gocek. Both very sympatic with individual and familiar atmosphere. We will treasure this trip as unforgettable."